Scientists have discovered a gene which, if it can be controlled, could be used to treat malignant pleural mesothelioma (MPM). The gene is called platelet-derived growth factor receptor beta (PDGFRB), and it could hold the key to preventing tumors from growing, spreading, or even developing in the first place. The discovery and its subsequent report was published in April 2017 by Genes & Cancer. 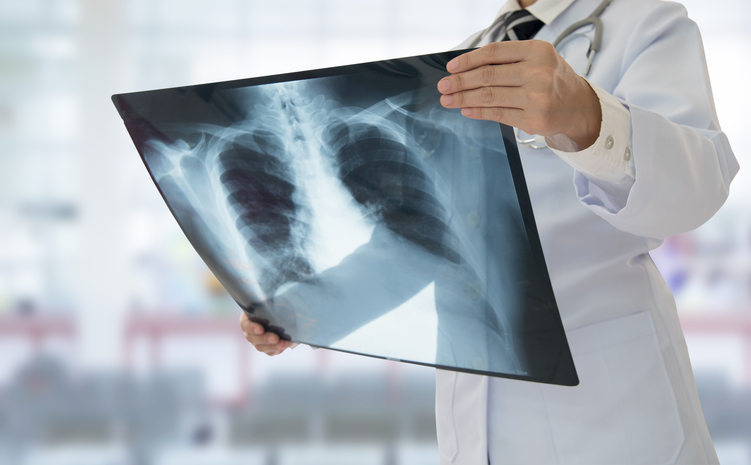 Malignant pleural mesothelioma is caused by the inhalation of asbestos fibers, which causes the mineral to embed itself in the pleural tissues of the lungs. Their presences irritates surrounding tissue and causes abnormal tissue growth. This growth is what eventually leads to tumors, some of which are malignant. There is no cure for mesothelioma, and it can take decades for the condition to develop symptoms. Pleural mesothelioma is caused by the inhalation of asbestos fibers, which become embedded in the pleural tissues of the lungs. Around 20-40% of MPM tissues “overexpress” PDGFRB, meaning the gene is more active in those tissues than in surrounding tissues. Overexpression may also predict cancerous cells in general, as there is less expression of PDGFRB in non-cancerous cells. In summary, this gene shows up in a significant amount of cancerous tissue and is conspicuously absent from non-cancerous tissue. Unfortunately, researchers have yet to discover why this is the case—however, that didn’t prevent them from testing the effects of “silencing” expression of PDGFRB. They used a “silencing RNA” (siRNA) to prevent the gene from being expressed to see how it would affect malignant mesothelioma tissues. REDUCED CLONOGENICITY – THIS MEANS THE ABILITY FOR THE MPM TISSUES TO REPRODUCE FROM A SINGLE CELL (ONE OF THE CALLING CARDS OF CANCER) WAS SLOWED OR INHIBITED. INCREASED CELL DEATH – HEALTHY CELLS EVENTUALLY STOP REPRODUCING AFTER A CERTAIN AMOUNT OF LIFE CYCLES, REACHING A STAGE KNOWN AS “APOPTOSIS.” CANCER CELLS NEVER REACH APOPTOSIS, ALLOWING THEM TO REPRODUCE AGAIN AND AGAIN IN PERPETUITY. NON-EXPRESSION OF PDGFRB SEEMS TO HAVE CAUSED A HIGHER RATE OF CELL DEATH AMONG MPM CELLS. REDUCED CELL MIGRATION – STAGE IV CANCER BEGINS WHEN CANCER SPREADS FROM THE INITIAL TUMOR TO OTHER ORGANS AND PARTS OF THE BODY. INHIBITION OF PDGFRB SEEMS TO PREVENT MPM CELLS FROM TRAVELING THROUGHOUT THE BODY, PREVENTING MPM FROM REACHING STAGE IV IN SOME CASES. Platelet-derived growth factor or platelet-derived growth factor receptor treatments are available currently in clinical trials for leukemia, glioma, and GIST. As researchers continue to explore their effectiveness in treating mesothelioma, The Williams Law Firm, P.C. hopes the treatment becomes widely available to as many mesothelioma patients as possible. These benefits seem too promising to not explore this therapy further. The Williams Law Firm, P.C. is comprised of New York mesothelioma lawyers who have spent nearly 25 years representing workers and other victims of asbestos exposure. Employers have known about the dangers of asbestos for nearly a century, so they knew exactly what you were risking when you came in to work every day. Treatments like the one we just described are few and far between, and virtually all of them are more than most families can afford. It’s your employer who should pay for your treatments—not you. That’s the foundation of our firm’s philosophy. If you need a lawyer to speak for you, to fight for your ability to pay for treatment and recover other damages, call us at 855-575-MESO (6376) today. ← Can You Recover from Mesothelioma?